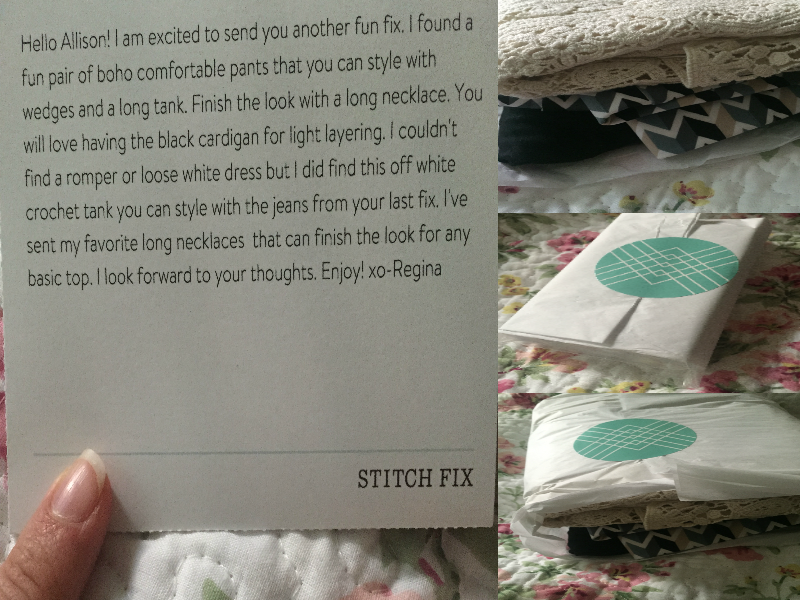 Stitch Fix! This is actually my second time "unveiling a box", as other Stitch Fixer's call it. Let me brief you real quick. Stitch Fix is a styling company that hand picks select clothing items based on your "Style Profile". You can receive as many boxes as you want by scheduling "a fix" or make them automatic monthly "fixes". Each box cost $20 to style. If you end up liking an item in that box and want to keep it, you get $20 off that purchase. You can buy as many items as you like. If you buy everything in the box you get the $20 off + 20% off your whole purchase. I wrote to my Stylist asking for nice, soft, romantic boho items. I asked for wide leg pants, a cute sophisticated romper and a new white dress. As you can read above, they didn't have the last two in stock and I'm assuming she went off of my Easy Breezy Pinterest board based on her decisions. It's very interesting to see the items that get picked out for me based on my pinterest boards! First off, I'm sorry the lighting is so terrible. I had to take these at night. The only bummer with Stitch Fix is that you only get 3 days to choose what you want before they have to be sent back in the mail. What I Love: The Crochet Top. The idea of the Wide Leg Pants and they are SO soft, pajama soft. How adorable and sweet the Mikka necklace is. I love the pointed arrow (see picture below). 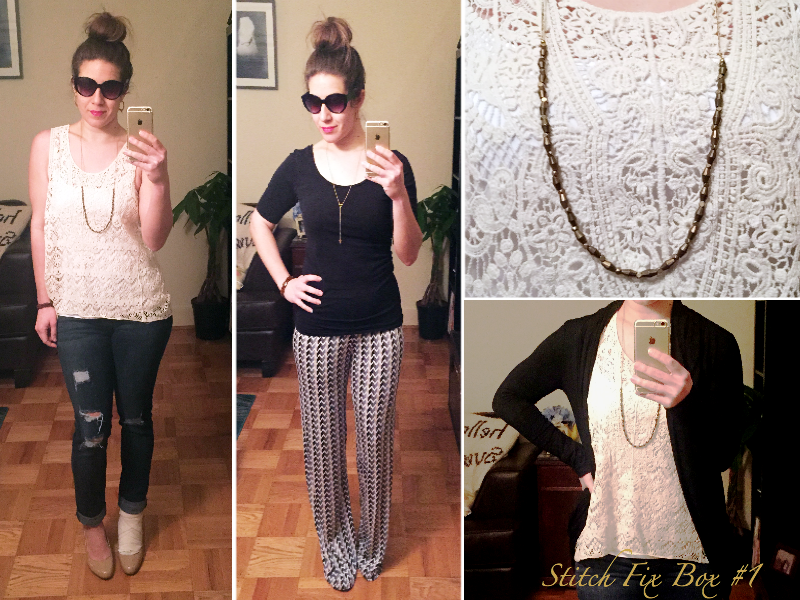 How easy the Skylar Necklace and Cardigan are to pair with everything. Unfortunately, I love the crochet top so much that I own one almost identical to it! Such a shame but A+ to my stylist for knowing my style! The Wide Leg Pants. They are too busy for my petite frame. If they were a different pattern I would have kept these and never looked back! I'm just not a fan of small zigzag patterns. The Cardigan -- You thought I was gonna keep it, huh!? Well, I already own one very similar to it and even though I like this one just a bit more, I couldn't justify purchasing another for the price. This leaves the necklaces. 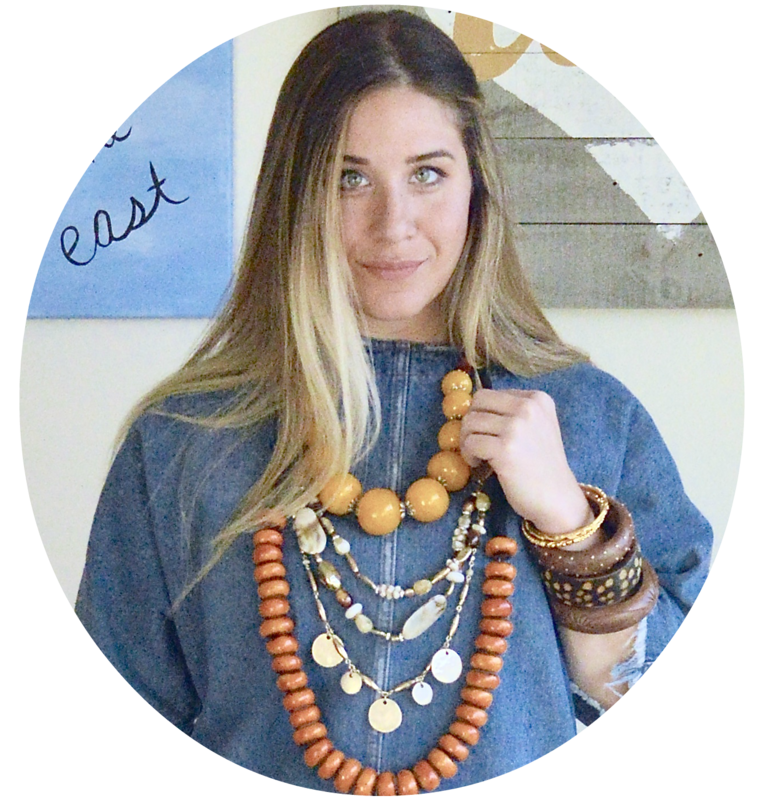 I love the simplicity of the Skylar Necklace but I also feel like I could pick this up at a craft fair along the PNW coast line. The Mikka is very unique and I did a quick google search and found out that it's plated in 18K Gold. I don't know about you but I'm a gold snob. It compliments my olive skin so much better than silver. It's something I would wear to work and it compliments so many of my wardrobe pieces. Again, I do get $20.00 off my purchase but for this box I decided to not buy anything and because of that I'm actually out $20. I don't think it's actually worst $20 for the experience. Personally. I think Stitch Fix is definitely produced for a certain type of woman. I live in the city and have time on my hands to shop when I'm bored and hunt for specific pieces at a specific price. I don't necessarily think Stitch Fix is geared towards women in my demographic. 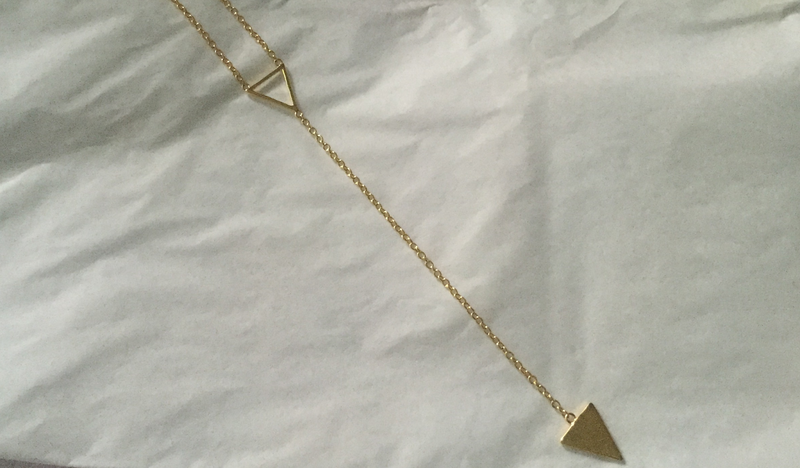 I recommend trying Stitch Fix just for the experience. It so much fun waiting for your box and actually seeing what someone would style for you. If you feel like it's something that is in your demographic, they have a $25 credit program per friend. It's definitely worth helping marketing it out to your friends on social media. I'd love to hear how other's boxes have gone!